Now it's my turn, with Tara Dairman's debut ALL FOUR STARS, coming from Putnam on July 10th. I have loved this story ever since I saw the first 250 words in Authoress Anon's Baker's Dozen Auction in 2011. It was no surprise to me that it was snapped up by agent Ammi-Joan Paquette, and then a publishing deal was forthcoming in short order. This is classic middle grade, full of heart and humor. Gladys' parents are disasters in the kitchen--yet Gladys has gourmet tastes. The opening scene is indelible, with Gladys setting fire to the kitchen curtains with her father's blowtorch as she tries to put the finishing touches to the aforementioned crème brûlée. The pace is unflagging as Gladys's school essay on "My Future" gets picked up by the food editor of The New York Standard. But the editor doesn't know Gladys is 11. It's up to Gladys to come up with some innovative ideas on how to sneak into New York City, review a top restaurant, and write her newspaper copy. Can you say "sticky situations?" They abound. My favorite one finds Gladys under a restaurant table... but if you want to know why she's in this situation, you'll have to read the book! As a child, Roald Dahl was unquestionably my author of choice, with Matilda, The Witches, and The BFG topping my favorites list. (There's a BFG reference in ALL FOUR STARS, actually—see if you can catch it!) Then, of course, I grew up and had to read more serious stuff for a while. But in my early 20's, a little series called Harry Potter started blowing up, and I fell in love with middle grade all over again. I followed the Harry books with a Series of Unfortunate Events, which I also adored, so I credit J.K. Rowling and Lemony Snicket with bringing me back to kidlit, and inspiring me to try my hand at writing some myself. ...saying the phrase “I speak a little Mandarin” in Mandarin. I learned that phrase, along with some other travel-related ones, off a CD before I traveled in China. Apparently, I learned it a little too well, because people who heard it would then try to have long conversations with me in Mandarin, much to my befuddlement. Sadly, the CD refused to teach me how to say “I do not speak Mandarin”! Fruit-topped Belgian waffles, bacon, and home fries, with a glass of milk and maybe some fresh-squeezed orange or grapefruit juice on the side. Immediately followed by a nap. I already mentioned Bhutan, right? I got a glimpse of the Himalayas from western China, and have been itching to go back ever since. 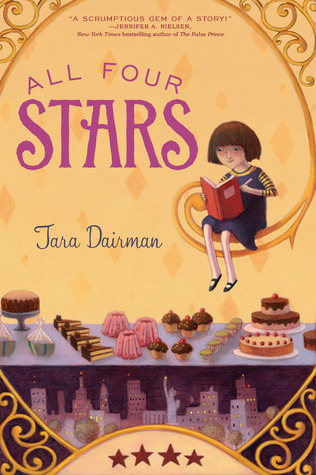 Tara Dairman is the author of the middle-grade novel ALL FOUR STARS, which will be published by Putnam/Penguin in 2014. She is also a playwright and a recovering round-the-world honeymooner (2 years, 74 countries!). Tara's book sounds fantastic. And loved hearing about her favorite authors. Thanks for the fun interview. Great interview, Michael! I had the honor of reading ALL FOUR STARS a while back and it is truly a delight. I've already pre-ordered my copy! Yay, Tara! And go, Gladys! This looks so fun! I just watched Masterchef Junior and fell in love with the kid-chefs with gourmet taste. Can't wait to read this. Rules to Tweet By: Social Media and You!